No matter how young or old you are, it's important to feel comfortable and confident in what you decide to wear. Clothes are a practical necessity, since they offer modesty as well as warmth and protection from the elements, but they can also be a distinct expression of your personality and creativity. Remember that being stylish is something that can be individual. So if you feel good in what you are wearing, you will always look fabulous! If you’re keen to revamp your wardrobe or update your fashion style, here are a few ideas on where you can get inspiration. Take inventory of what you already have. Are you only wearing a fraction of what you have in your wardrobe? If so, try to clear out unwanted items before buying anything new. It can be quite therapeutic to get rid of items taking up valuable space—space that could instead be used for clothes you actually enjoy wearing. TIP: If you haven’t worn something in a year or so, then you probably won’t miss it. However, take the time to sort things out slowly and thoroughly. Sometimes you can overlook an item you haven't worn in a while which, on closer inspection, is actually something really wearable. If in doubt, try it on and see if it’s something you can imagine wearing again. There are many online videos that can offer sensible advice on how to sort out your old clothes. Trinny's Wardrobe Detox on YouTube is a good place to find out how to organise what you own. Window shopping. High street shop window displays can also offer great style ideas at no cost to you. Shopkeepers spend hours dressing mannequins in eye catching ensembles, so the next time you walk past a shop you like, take the time to admire their work. You may even get some inspiration on how to enhance your own style. And if you really love a look, just snap a photo with your smartphone! Mix and match. Create a capsule wardrobe by putting your various items of clothing together in different combinations to see how well they work together. You might own some great individual pieces that simply don’t complement your other clothes. Try to isolate these items, then decide to get rid of them or else buy a couple of extra items that will make them worth keeping. 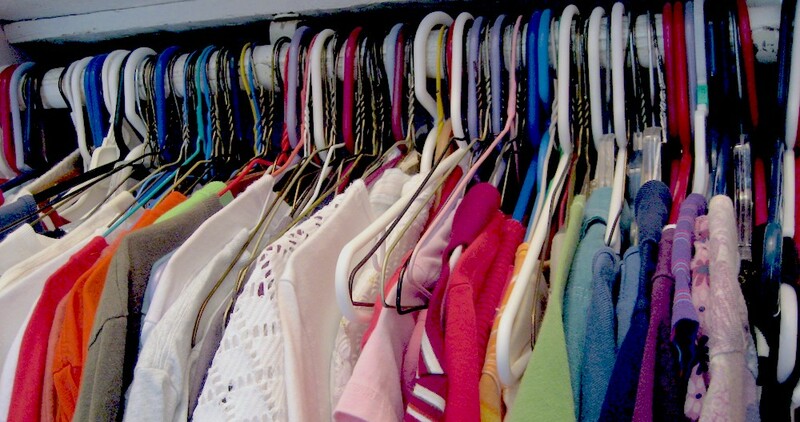 TIP: Any clothes you discard can be donated to charity, so by downsizing your wardrobe, you are also helping others. Get in the mood. Once you've looked at what you have, you can create your own mood board of images and materials (and sometimes even words or phrases) that communicate a particular style or concept. Mood boards are a great starting point to help you work out styles you like, especially if you’ve never considered that style before. To make a mood board of your own, simply cut out pictures from magazines or even try sketching ideas out yourself. You’ll quickly get an idea of what styles appeal to you. You don't need to keep up with the world’s top fashion icons and style gurus, but you can easily take a look at what other fashion enthusiasts are wearing. A good way to do this is by flicking through the fashion pages of magazines or by logging onto some websites that focus on fashion and style. InStyle is the online version of its established printed counterpart. It targets a mature female audience and shows readers how to adapt big trends so they work in a more wearable way for everyday style. LivingBetter50 sets out to inspire women to dress well at any age. Prima has a very digestible fashion section with ideas for women who want to follow current trends. Saga provides tips on makeup and smart shopping. Sunday Times Style specialises in high end fashion inspiration with a mature and sophisticated feel. It's a nice place to see beautiful images and identify top trends. Advanced Style is photographer Ari Cohen’s celebration of people dressing fabulously! Emma Summerscales’ blog tells the story of a fashionista who made the swap from a career in quantity surveying to wardrobe restyling. That’s not my age is "the grownup guide to great style", courtesy of a former fashion editor who shows us how to dress well at any age. Add a personal touch. Once you’ve decided which clothes you’d like to keep in your wardrobe, think about adding detailing—such as a lace trim to a hemline or new buttons to a tired looking cardigan. There is lots of help and inspiration on restyling clothes online; check out How to Restyle Old Clothes: Style & Fashion Tips on YouTube. TIP: Personal embellishments don’t need to be saved only to refresh old clothes. You can buy a new jumper or skirt from a cheap high street shop (or even second-hand from a charity shop), and then just tweak it here and there to give it a really special look. Find information on taking up a range of fashion-related crafts such as sewing, knitting, jewellery making right here in the crafts section of Jewish Care Interact. Don’t forget about makeup. If you’ve never been brave enough to try a bright shade of lipstick, well now may be the time to give it a go. There are lots of makeup tutorials available online, like Hannah Rupp's How to Match your Lipstick to your Outfit. If you want to change your style completely, try taking a look at some magazines, style websites and fashion blogs to see what trends people are talking about. Grey Fox calls itself a mature blog for men interested in style. The Male Stylist is a smart and sophisticated blog focusing on chic fashion and classic style. Saga has easily accessible suggestions for strategic shopping and fashion for men. The Telegraph in conjunction with the newspaper, this male-focused online magazine offers articles and advice on how to dress stylishly as a modern man. Change your choices. There are many options for men out there these days. Make a note of what you like and then go try some items on. Go for a larger collar on a shirt or a different style of suit. Think about alternative fabrics or patterns and incorporate colours that might be slightly different to what you’d usually choose. Inject colour using a new tie or pocket square. Swap a classical shirt and tie for a more casual open collar or even try a dickie bow! Feet first. New shoes can really smarten up an old look. There are many great styles to choose from, so step outside your comfort zone and try on something different. Hats off! Think about swapping an old hat with a newer style, or even consider updating your current one by replacing any embellishments that have become tatty. You could visit your local tailor or seamstress and ask about their prices to complete these jobs for you. Shop savvy. Men’s fashion has really taken off over the last couple of decades, and many big retailers who previously focused on women’s fashion have really developed their men’s ranges. Take the time to research the stores nearby and make time to go and visit them. After you've done your homework, you'll be ready to do some serious shopping. TIP: Consider bringing a friend along—not just for the company, but for advice. They can help encourage you to try new styles. Try something new. Refreshing your style could be as simple as visiting a few shops which you'd normally walk right by...but this time, go inside! Then see what other shops there are on your local high street or shopping centre and have a good browse. You may be surprised at what you find. Try something old. Don’t forget to check second-hand shops. You can find great bargains and more unusual items. Think about your body shape. Don’t get too hung up on this, but it is advisable to have general idea of the sorts of styles that flatter your figure most. There is a huge selection of online videos offering fashion advice. For instance, UK style experts Trinny and Susannah have their own YouTube channel, offering viewers help with everything from identifying body shapes to choosing shoes. There is also How to Dress to Flatter Your Body Type for Men: Men's Fashion Advice from ehowbeauty. LookAgain.co.uk has a body shape calculator where all you need to do is enter your measurements and they’ll help you determine your shape. You'll also get suggestions for styles to wear. Mix it up! It's a common mistake to think the best dressed people are wearing expensive clothes. This simply isn’t true. Most fashionistas will confess that the secret to a good outfit is to combine luxury and low budget items together. They won't hesitate to team high fashion items (such as trendy statement prints and textures) with classic timeless pieces they’ve owned for several years. Accessorise. Fashion icon Donatella Versace once said, "The most valuable item in your wardrobe is not a piece of clothing; it is an accessory. With a quick switch of a bag or a pair of shoes, you can instantly change your look and mood." And many would agree with her! Ask for help. Next time you’re in a shop and the sales assistant asks if there’s anything they can do to help you, say “Yes!” In fact, before you go shopping, make sure you are prepared with a few questions. For instance, you could say something like, “I know this season is all about stripes. Do you have anything you think might work for me?” Sales assistants will know their range of clothes from top to bottom, so it’s a good way of quickly finding the styles you’re interested in without having to trawl the entire shop floor and getting exhausted even before you get to the changing room. If you have the time, inclination and finances to make a commitment to studying, there are a few really interesting courses available. While many of these are offered around London, it’s worth having a look around online and also enquiring at a local university or college. Finally, if you feel like sharing any of your own fashion tips, why not sign up to our online forum and start a new discussion?